Last year I went to 3 wildcrafting classes with Emily French of Sweetgrass Herbals. At one of them she introduced us to witch hazel. I harvested a few leaves, then went to look for trees on my property, down by the stream. I found a few! So I picked a couple more leaves. And made a small tincture of them using alcohol. 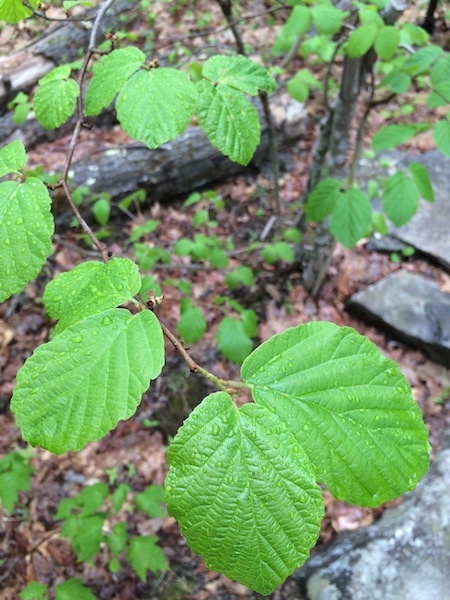 Later that year, as I was hiking the mountain, I noticed that part of the trail was lined with witch hazel. Tons and tons of it. I filed that knowledge away for the future. Two weeks later, the leaves were out and I spent some time gathering them (as you can see, I hiked after a rain shower), a few from each tree, giving thanks for the medicine as I harvested. When I got home I put them into a jar with rubbing alcohol, after reading about that as menstruum for a liniment in my herbal studies. 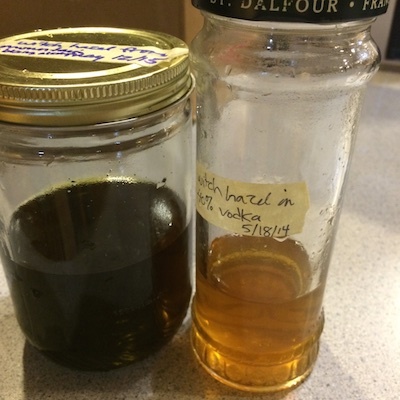 I figured it would be a good comparison to the other tincture I made. It’s hard to tell, but the one on the left is VERY green. The rubbing alcohol pulled every bit of green out of those leaves. The one on the right pulled color – it was plain clear vodka to start – but not nearly as much. I tried them both on an itchy patch of skin. The one on the left worked better, too. I do have to say that it smells awful though. Not anything like the witch hazel you get from the drug store. It smells like rubbing alcohol. Speaking of that, why is the witch hazel you buy clear? I don’t intend to use the store-bought one in the future. Not if I can buy a bottle of rubbing alcohol for as cheap as a bottle of witch hazel, pick free leaves infused with the energy of thankfulness, and just combine the two for several weeks. In fact, I intend to make another batch or two this summer to have enough to get through the winter until the leaves bud again in the circle of the seasons. I love making my own medicine!